Kids camp is offered at both of our camp locations—Youthfront Camp West and Youthfront Camp LaCygne! What is a typical day at Kids Camp? We start the day together in our Chapel with Morning Prayer. This time includes reading scriptures, music, and both corporate and private prayer. Campers gather together in our Chapel each morning for worship and to hear from our Storyteller about our theme for the session! This time is for team building activities, games, and tactile experiences that correspond with what the Storyteller shares in Morning Gathering. A highlight of every Kids Camp session is having an all out shaving cream war on our sports field! 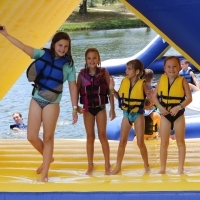 Each afternoon we open all of our camp activities and facilities for campers to have fun! In addition to our main attractions (pool, splash park, waterslide, ropes course and more), there are organized activities offered throughout the afternoons. Cabin leaders will provide multiple group opportunities for campers to do activities together, always upholding our value of camp being a safe place for kids. Campers gather together in our Chapel each afternoon for worship to hear more from our Storyteller. We will have a 30 minute “rest time” where campers will go back to cabins with their cabin leaders to relax and have some quiet time together with their cabin mates. Activities include coloring, journaling, reading, or even napping! This time is for team building activities, games, and tactile experiences that reinforce the theme of our session that they heard about in the Afternoon Gathering. Whether it is an outdoor game (Nightstrike!) or a Pool Party, each night at camp has a different theme where staff and campers will dress in costumes for all out fun and craziness. After settling down and getting ready for bed, campers will turn lights out and get some much needed rest!